Well another month has been and gone in a flash, for M2M One and the IoT industry in general there has been a lot happening! In this issue we will be discussing our experiences at IoT Asia, changes to CISCO Jasper API security and a continued discussion on the progress of Telstra’s NB-IoT Launch as well as the 2100MHz 3G shutdown. M2M One are gearing up for big last half of 2019 with at least 5 – 6 tradeshows on the calendar for us to attend – Keep an eye on our upcomming newsletters for details of shows coming up in your region with information on how to attend and meet the M2M One team. IoT Asia was back in Singapore last week and once again showcased a wide array of businesses either looking for or offering services in the M2M and IoT Space. While smaller than previous years, it was a great regional showcase for some of the more innovative and interesting applications in IoT. There was a lot of buzz around NB-IoT and Cat-M1. Interestingly there were many companies developing hardware and software solutions, even though there are still only a handful of countries around the world and specifically in APAC with these networks up and running, (Australia being at the forefront of Cat-M1 deployments). With the ever increasing power of data and control being understood there are many new industries being introduced to M2M and IoT. One such industry that had a number of players on show at IoT Asia this year was the connected Public Bathroom. Sensors dotted around Public Restrooms on toilet roll holders, doors and stalls with Ammonium level sensing, collate information and let the cleaning staff know when to clean the bathrooms – increasing both time and cost efficiencies while maintaining better quality facilities for the customers. This is a great example of an industry that would never have thought of a connected solution a mere 5 years ago, but the advancement in the hardware, software and networks has made this a possibility. If you are keen to explore ways in which you may be able to take advantage of new technologies like this please get in touch with the IoT specialists at M2M One for a discussion. As is required from time to time, Jasper has an upcoming maintenance planned on its API Security Certificate. If you access the Control Center Platform via the API or a system that uses a pre-loaded *.jasper.com certificate , then you may need to take further action to ensure that you can continue to access the platform after this change. This change only affects customer using the API – and you should have also received a direct communication from Telstra regarding this. Planned Change Date: 17th April 2:00pm AEST and will take about 2 hours. Telstra are still finalizing what the commercial plans will look like and as soon as we find out we will share them. In the meantime if you would like to trial some NB-IoT SIMs please get in touch. Telstra 2100Mhz 3G Shutdown has been delayed. We have mentioned in the past few newsletters that the 2100Mhz shut down will commence from 25th March 2019. We have recently received information from Telstra that this has been delayed until 30th April 2019. The main reason for the delay is to allow certain devices detected on the network time to change the hardware as it was detected that they would not work on 850MHz. As previously discussed, as long as your device in the field can operate on the 850Mhz frequency or LTE (Band 28 – 700Mhz or Band 3 – 1800Mhz), you should be fine – you may need to do a power cycle to re-register to the network. 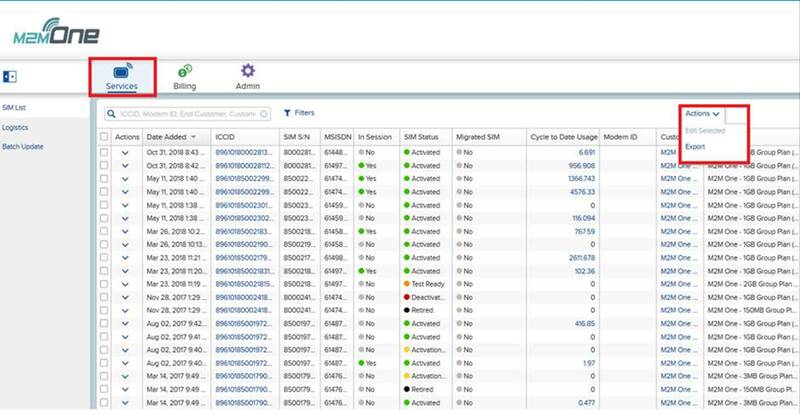 One of the great features of Cisco Jasper, is that you have the ability to add customer information to every sim card you have under management. This help for support and in breaking down the information at the end of each month when doing reports. While you can do this by manually editing each field, when you start connecting larger number of devices this can become quite tedious. Enter the Batch update – Instead of updating Custom Fields manually in Jasper, or changing SIM States page by page, large changes can be made via uploading an excel spreadsheet through a Batch Update. This feature is quite useful for when you have a number of SIMs needing updating. Start by navigating to the services page. From here you can take an export of your SIMs. This will create a spreadsheet that can be opened in Excel. On this sheet you can then make the changes you require. Step 2 – Edit the sheet with your specific information. In order to upload these changes, you will need to save the spreadsheet with some specific headings (More details on this below) and upload it back to Jasper. This can be done by clicking on Services, then Batch Update. Under the Actions option you will then be able to upload the file. Jasper will send you an email when the file has been uploaded. There are some special considerations when utilising Batch Updates. The SIM ICCID must be used as one of the columns, as this is how Jasper identifies the SIMS. There are also special headings you must use for each field and not your custom headings, and these can be found below.